We decided to go into the olive oil business in 2000. Having a family history in farming and a feel for growing things we took the plunge. We never looked back and delight in the process. We have traveled the world in search of people expert in this ancient product and consider ourselves just damn lucky to be a part of this industry. We planted 3500 Frantoio olive trees in 2005 with the intent to make the best monocultivar olive oil mother nature would allow us to make. This required that we have our own mill to insure that we have complete control over all aspects of the process. 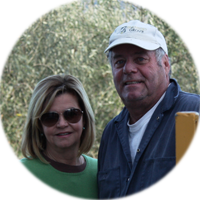 We are very fortunate to have met many generous people who have shared their passion for making olive oil. The most exciting day at the grove is of course the first harvest day of the year. Waiting in the field before dawn hoping the picking crew shows up. Making sure they have everything they need. Starting up the milling equipment hoping that everything works under the load of the new olives. Anticipating that first bin, the first push of paste to the separator and the first oil. Relief and Joy. Repeat for the next 20 bins and praying for no “incidents”. The first day of harvest is the most exciting; the best day is when the last olive of the year falls into the crusher. We sell our oil directly from our website. We also now have our oils distributed in Japan too!